It's no secret that I love risotto. Over the past several years I have experimented with so many different flavors and ingredients. 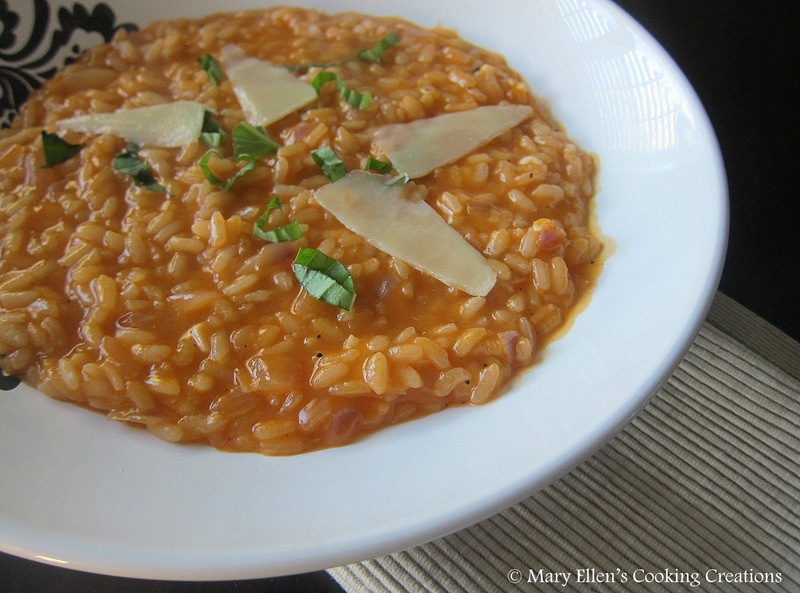 Click here for all of my risotto posts, or take a look at the list of risotto recipes in my Recipe Index. After making homemade sauce and lasagna with my sister last week, I had some leftover fresh basil that I was dying to use. I started to think back to my grandmom's homemade sauce; she would simmer the sauce all day with chicken in it and it was just heavenly. She would also serve rice that had cooked in tomato sauce along with the chicken. Remembering those meals is what gave me the idea to make a tomato-basil risotto. Add the sauce and just a touch of broth (a few tbsp); stir until absorbed. At this point you want to lower the heat to medium. Add a ladle of broth, the chopped basil, and stir until absorbed. Continue this step until you have used all/most of the broth and the rice is tender, but still has a bite to it. From the first ladle of broth to the rice becoming tender takes about 18 minutes. When you add your final ladle of broth, also add the cheese. Stir until the broth has absorbed and the cheese has melted, but the risotto still has just a touch of liquid to it (see my picture). Spoon into shallow bowls, top with basil and Parmesan strips.